Preheat a heavy bottomed soup pot over medium-low heat. Add coconut oil, onion and sea salt. Cover and saute 5 minutes. Add celery and carrots, stir, cover and saute an additional 5 minutes. Add ginger, garlic and garam masala, stir, cover and saute another 5 minutes. Add crushed tomatoes and simmer for 30 minutes. Add water, increase heat to boil, reduce heat and simmer an additional 30 minutes. While the soup is cooking/simmering prepare the rest of the meal. I served vegan baked potatoes and salad but a sandwich would be wonderful too. This entry was posted in in the kitchen and tagged masala, recipe, soup, tomato, tomatoes, vegan, vegetable on February 10, 2016 by lenapietri. Pictured here with arugula topped with pear and pomegranate and tuna salad. Preheat a soup pot to medium low, add canola oil, onion, celery and sea salt and simmer for 5 minutes with lid on. Stir occasionally and add 1 Tablespoon of water as needed to prevent burning. Add remaining ingredients, bring to a boil, reduce heat to simmer and cook for 30 minutes. Puree the ingredients with a handheld immersion blender OR allow to cool, puree in countertop blender, return to pot and reheat. Add more water as needed for the consistency and salt and pepper to taste. This entry was posted in in the kitchen and tagged cashew, cream of, creamy, easy, Popeye, recipe, simple, soup, spinach, vegan on November 12, 2015 by lenapietri. My son and fiancé are following Jennifer Schonborn‘s detox diet this week. This meal aligns with her guidelines so when they joined us for dinner we could all enjoy. We started the meal with CREAM OF BUTTERNUT SQUASH SOUP (prepared with extra virgin olive oil) and then on to the main meal. Cut off stems and the thin root tail and scrub the beets. Place in a medium sized pot, fill with enough water to cover and sprinkle with sea salt. Bring to a boil, reduce heat to simmer over medium low to medium heat. Simmer with lid on for 20 to 40 minutes until the beets are tender. Test with a toothpick, if it inserts easily they are done. Remove from heat, pour off hot water and pour cold water into the pot and let sit 10 minutes to cool. Repeat until the beets are cool enough to handle. The skin will slide right off with a little bit of pressure. Remove skins, slice in half and slice to 1/4 inch thickness. Chill the beets completely in the refrigerator. Assemble the salads just before serving; place beets on a bed of arugula, sprinkle with sunflower seeds and drizzle with lemon garlic dressing. Combine ingredients in a glass jar, tighten the lid and shake. Serve with a spoon or mini-ladle. Bring rice and water to a boil, reduce heat to medium low and simmer for 15 minutes then reduce heat to low and continue to simmer 5 minutes or until all of the water is absorbed. Check by tipping the pot sideways carefully to see if any water remains. Combine garlic, ginger, parsley, sea salt and pepper in food processor. Process until finely ground, scraping down the sides as needed. Add the lemon juice and olive oil and process until smooth, scraping down sides as needed. Place the salmon on a lightly oiled broiling pan and sprinkle with salt and pepper. Turn Broiler on high and place salmon under flame for 10 minutes. This entry was posted in in the kitchen and tagged arugula, beets, black, broiled, butternut, cream, detox, dinner, dressing, garlic, lemon, of, parsley, recipe, rice, salad, salmon, sauce, soup, squash on April 21, 2015 by lenapietri. Mix all ingredients together. Mix or shake before each use. Store at room temperature. The night before roasting the turkey- Remove the neck and giblets from the turkey and rinse inside and out then pat dry. Make a paste with the above ingredients. Rub the paste all over the turkey, inside and out, place in a basin/container, cover and refrigerate. Preheat oven to 300-325. An 8-12 lb turkey will take 2 ¾ to 3 hours to cook; plan accordingly. Place the turkey on a rack in a broiling pan and pour 1 cup water into the pan. **if making Rik’s gravy read the recipe below to put vegetables in the pan as well** Place a lid over the pan -or- loosely “tent” the turkey with aluminum foil. Do not baste the turkey and do not open the oven door. Remove the lid/foil for the last hour so the turkey browns. The meat thermometer should read 165°F when inserted in the breast meat it is good practice to double check the turkey timer. When the turkey is done remove from the oven and pan and place on the cutting board and cover with the foil for 20 minutes before carving. Note- Grandma Pietri roasts the turkey without a rack, allowing it to sit in its own juices and keeps it covered the whole time. She bastes the turkey every couple of hours for the duration of the bake time. My brother Rik, cook extraordinaire, gave me the “rack don’t baste” recommendation. Place the giblets (minus the liver), celery, carrot and onion into the pan under the turkey with water to keep it from burning. After the turkey is finished baking strain the vegetables and poultry drippings through a sieve into a large (at least 4 cups) measuring cup. Deglaze the roasting pan with 1 cup broth/water, stirring until the crusty brown bits are loosened and pour the liquid through the sieve with the other pan drippings. Over medium heat, spoon 3 tablespoons fat from the poultry drippings (floats to the top of the measuring cup) into a 2-quart saucepan. Whisk flour and sea salt into the heated fat and continue to cook and stir until the flour turns golden brown. Meanwhile, skim and discard any fat remaining on top of the poultry drippings. Add the remaining broth and enough water to the poultry drippings to equal 3 1/2 cups. Gradually whisk in warm poultry drippings and broth mixture. Cook and stir until the gravy simmers and is slightly thick. Season with more salt and fresh ground black pepper to taste. Preheat oven to 400, prepare bread, arrange on baking sheet in a single layer and toast until golden brown. Remove toasted bread cubes from oven and pour into a large bowl. Preheat a large skillet to medium-low and sauté onions and celery in butter until tender, about 5 minutes. Remove from heat and stir in herbs and spices. Pour over the bread cubes and stir to combine well. Add stock and egg a little at a time so the stuffing is moist but not packed together. Turn mixture into a shallow butters baking dish and bake at 350 until the top has formed a crust and the stuffing is heated through, 25-40 minutes. Slice cooked sweet potatoes into 3/4 “ thick rounds. Arrange sliced sweet potatoes in a buttered 10x6x3/4” pan in an even layer. Cook and simmer reserved syrup, brown sugar, cornstarch, orange peel, salt, and cinnamon for 3 minutes. Add the apricot halves and pecans and simmer for an additional 2 minutes. Pour the mixture over the sweet potatoes and bake for 25 minutes. Scrub 8-10 organic potatoes (otherwise peel), place in a large pot, add water to just cover the potatoes and sprinkle with 1 teaspoon sea salt. Bring to a boil and immediately reduce heat to a slow simmer. Cook till the potatoes are tender, almost falling apart (about 30 minutes depending on the size of the potatoes). Drain potatoes and return to pot, coarsely break apart and allow to cool slightly (this will help the potatoes to dehydrate so they can absorb butter and milk/cream). Add 6 tablespoons butter, 1/2 cup milk/cream, 1/4 teaspoon sea salt and 1/8 teaspoon fresh ground black pepper. Turn heat to low and using a hand beater whip the potatoes with the butter and milk/cream and sugar till creamy. Add more milk/cream as needed for consistency. Season with more salt to taste. Love garlic? Add crushed 1-2 cloves garlic to the pot or simply serve with garlic butter on the side. Bring water and wild rice to a boil, reduce heat and simmer till the grains split (you will see with seems) and are tender, about 45 minutes. Meanwhile, sauté the vegetables in butter on low heat till tender. Drain the water from the wild rice, add the sautéd vegetables and salt and pepper to taste. I have also tossed in cooked white or brown rice so it is more of a pilaf. Remove outer leaves of red cabbage, cut in to quarters and remove the thick stem inside. Cut into think strips or chop into small chunks.sauté cabbage, onion and apples in canola oil. Add the salt, cloves, sweetener, vinegar and water and bring the mixture to a simmer. Simmer over low heat with lid on until the cabbage is tender, about 1 hour. Stir occasionally and taste to adjust seasoning. I believe this recipe was originally on an “Ocean Spray” package. 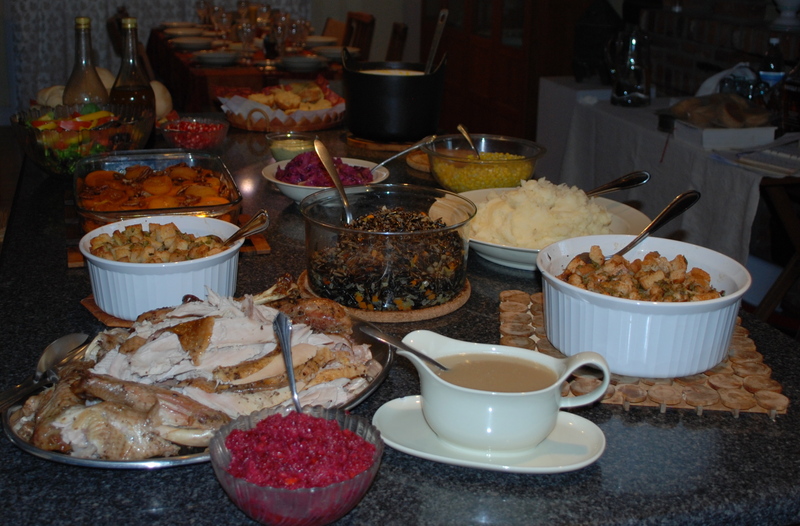 Process the above ingredients in a food processor at least 4 days and up to 2 weeks prior to Thanksgiving. This entry was posted in in the kitchen and tagged Apricot, baked, braised, Butternut squash, cabbage, cranberry, cream, fresh, gluten free, gluten free option, gravy, mashed, orange, pecans, potatoes, recipes, red, relish, rice, soup, stuffing, sweet potatoes, thanksgiving, turkey, vegan, vinaigrette, wild on November 21, 2014 by lenapietri.